GALION — A two-month Eagle Scout project changed Ken Fernandez for the rest of his life. The Colonel Crawford senior set forth two months ago to collect food for pantries in Crawford County. The goal for this project, which he undertook as the last step toward becoming an Eagle Scout. His goal at the start of the project was to collect 100 bags of food for pantries in Galion, Bucyrus and Crestline. To say his project was a success, is not even close to being accurate. In all, the project total 1,548 bags of food and supplies or more than 15,000 pounds that will be given to others. People in Galion contributed almost 2,200 pounds of food, which equated to 324 bags. Oh, and on the side, he was presented with an idea to collect goods for victims of Hurricane Harvey. 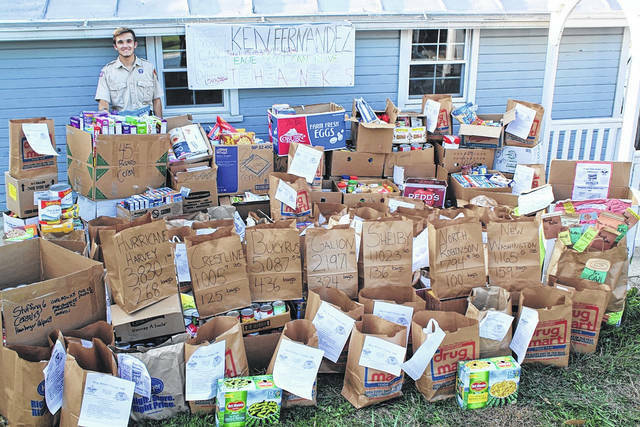 On one day, he collected 268 bags and more than 3,800 pounds of supplies for those victims. Within a few days, it had been delivered to the Grindstone Tap House in Berlin Heights where it was sent to Texas. Ken said he has never done a lot of speaking in public forums. This project required him to do that. In fact, the idea for the Hurricane Harvey collection came via his chat with folks at St. Paul’s Lutheran Church in North Robinson. Ken is the son of Mary and Brian Fernandez who live just west of Galion. He said people are more than willing to give when asked. And his practice of knocking on doors, talking to civic groups, church groups and city council meetings and setting up in the parking lot of the largest grocery store in Bucyrus, made it easy for them to give. If you’re keeping score, here are Ken’s final collection totals: Galion — 324 bags, 2,197 pounds; Crestline — 125 bags, 1,06 pounds; Shelby — 136 bags, 1,102 pounds; North Robinson — 100 bags, 794 pounds; New Washington — 159 bags, 1,166 pounds; Bucyrus — 436 bags, 5,086 pounds and Texas — 268 bags, 3,830 pounds. The grand total was 15,183 pounds of supplies. Courtesy photo Colonel Crawford High School senior Ken Fernandez stands amidst some of the more than 1,500 bags of food and supplies he collected for area food pantries and victims of Hurricane Harvey. https://www.galioninquirer.com/wp-content/uploads/sites/38/2017/10/web1_5E937A77657E4DDEBCEDA1D9D4A464FD.jpgCourtesy photo Colonel Crawford High School senior Ken Fernandez stands amidst some of the more than 1,500 bags of food and supplies he collected for area food pantries and victims of Hurricane Harvey.